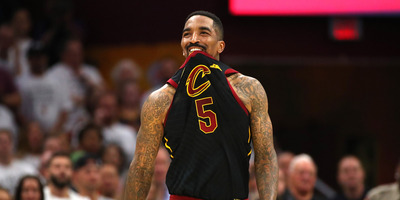 The loss came down to a mind-boggling decision from J.R. Smith, who seemed unaware of the score when he came down with a crucial offensive rebound with four seconds remaining and dribbled the ball out. After the game, Twitter was quick to roast Smith for his poor play in the final seconds of regulation. J.R. Smith did not have his best night on Thursday. With Game 1 of the NBA Finals tied at 107 and four seconds remaining, George Hill had one free throw to potentially give the Cleveland Cavaliers the lead. He missed, but Smith gathered the offensive rebound with enough time on the clock to put up another shot or get the ball to a teammate. Instead, Smith dribbled the ball out, apparently unaware that the game was tied and despite LeBron James’ pleas for him to move toward the basket. It was an unbelievable sequence of events that left fans either fuming or elated, depending on whether you were rooting for the Cavaliers or the Golden State Warriors. It was also, inevitably, turned into content for Twitter. Many grabbed onto James’ reaction to Smith – a photo that could’ve become a meme independent of the ridiculous context of the moment. Others drew parallels to another bone-headed moment in the final seconds of a championship: the Seattle Seahawks’ decision to throw at the goal line against the New England Patriots in the Super Bowl in 2015. There were also striking similarities between James’ and Smith’s reactions and the “distracted boyfriend” meme. Some chose to tie the moment to the ongoing rap feud between Drake and Pusha-T.
And others took a moment to reflect on how relieved Hill must have been that his missed free throw was free from criticism thanks to Smith’s awful decision. One Twitter user had fun by making a video depicting Smith running straight to a liquor store. It’s undoubtedly a moment the internet will not soon forget. The Cavaliers will look to put the game behind them and come back to even the series in Game 2 on Sunday.